Ground-Based Mobile ELINT System handed over to the Indian Air Force The Ground-based Mobile Electronic Intelligence (ELINT) System (GBMES) was handed over to the Indian Air Force (IAF) at the BEL, Hyderabad Unit on 18 March 2018. DRDO’s Defence Electronics Research Laboratory (DLRL), Hyderabad, is responsible for the system design, development of critical sub-systems, and realisation of engineered version of truncated GBMES system as successfully proved in the field. BEL, Hyderabad is the production agency for GBMES. Dr S Christopher, Chairman, DRDO, and Secretary, Department of Defence R&D, Ms J Manjula, DS and DG (ECS), DRDO, along with Mr MV Gowtama, CMD, BEL, handed over the system to the Air Vice Marshal BR Krishna, AVSM, SC, ACAS (Plans). The GBMES comprises one Control Station (CS) and three Receiving Stations (RS) integrated in master/slave concept to search, detect, monitor, record and process the hostile emissions as well as to find out the location of the emitter fulfilling the strategic EW requirements of the IAF. One of the three RS has also been configured to operate in master/ slave configuration (with minimal degradation) in the absence of control station. 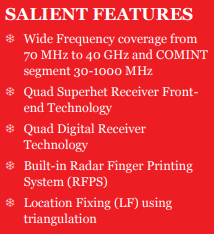 Each RS contains three ELINT Receiver Segments in the 70 MHz – 40 GHz frequency range. In addition, one Communication Intelligence (COMINT) Receiver Segment, operating in 30- 1000 MHz frequency range, intercepts and monitors the COMINT signals.